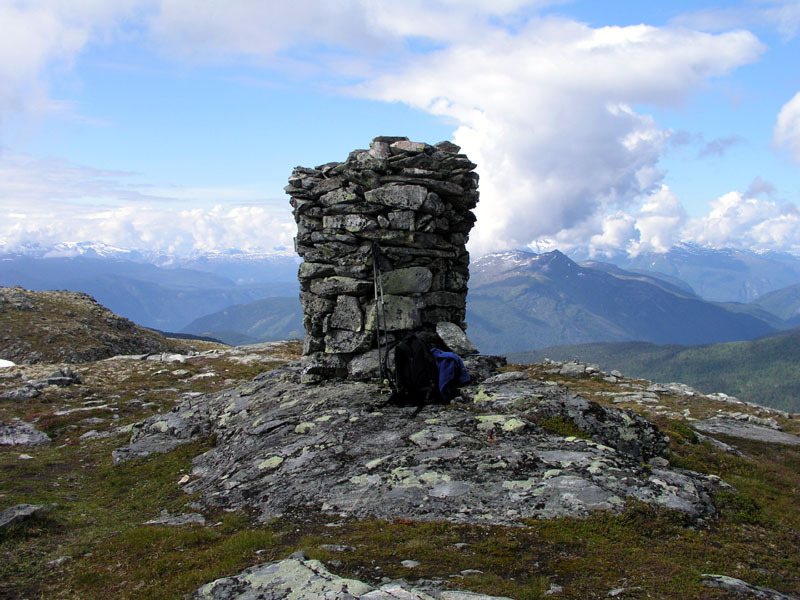 How to get there: This mountain is located near the village Sogndal. The approach from Bergen (or Oslo) is likely to come via Lærdal (Hwy. E-16). 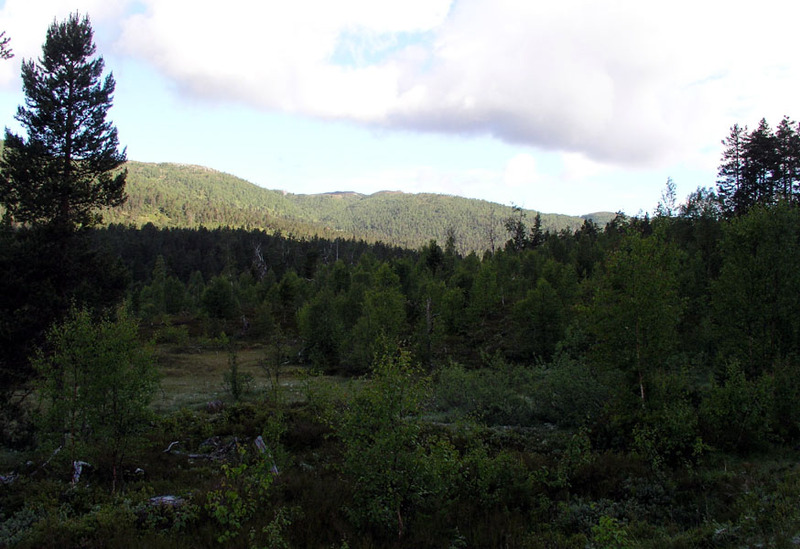 From Lærdal, drive in the direction of Sogndal, basically through a long tunnel to the ferry at Fodnes (NOK 89 in 2004). The ferry will drop you at the entrance to another long tunnel. Drive 7.5 km from the ferry and exit right (this is the first proper highway exit on your right). Immediately after exiting, turn right. This road heads back in a right turn underpass (under the road you came on), however, just before the underpass there is a smaller road that goes left. A sign saying "Dalåker 2" is posted. Turn left onto this road and follow it as it starts climbing the hillside. After approximately 1.5 km, the main road forks left, while there is also a road that continues straight ahead uphill. Continue on the uphill road another 1.6 km. There are a couple of smaller side roads that should be ignored, your road climbs steadily, then makes a big right curve and continues climbing the hillside. You will arrive at a locked gate, there is parking for a few cars on the side of the road in this area. Do not block the road as the owners of cabins higher up frequently use it, the road may also be used by heavy trucks and tractors. This trailhead has GPS coordinates, North 61:12.055, East 007:14.778 and elevation 402 meter. Route description: Go through the gate on the left side of the road, then head directly uphill along the fence on a small trail. This is a shortcut, you may alternatively walk on the road that makes a sharp bend left shortly beyond the gate. The trail will take you back up to the road, turn left and continue the gentle uphill. Almost immediately, another forest road heads up to your right, do not go that way, but continue straight. After about 1 km, a side road goes right, there are wooden signs here, one saying "Store Haugmelen 6km". Turn right and head up this road for another 2 km. At this point, a new gate closes the main road ahead, while a 4WD track forks right and climbs more steeply between the trees. A wooden sign, similar to the previous one, points up this track and says "Store Haugmelen 4km". Continue along the (very) rough road as it first climbs then contours around the hill that comes down from your right side. Next, the path descends slightly and crosses a stream via a relatively new bridge. On the other side, you are on the beginning slope to Store Haugmelen. Soon, the path heads a bit right and an alternative (short-cut) trail forks left and heads more directly up the hill. Choose either way, they merge back together a bit higher up. 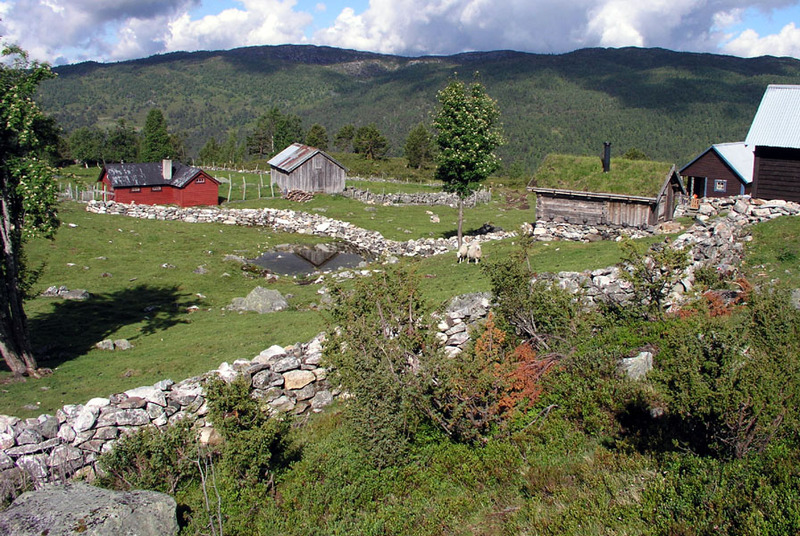 The track serves the Vassløysa farm cabins (seter), a number of houses, green grass and low fences built from stones removed from the field. A third wooden sign informs that the remaining distance is now 2 km. An optional, slightly longer loop is also signed for parties that would like to spend a bit more time and make a circular hike. Head straight uphill between the cabins, staying left of the (only) cabin having grass on its roof. The trail turns right above the grass roof cabin. Soon, a small creek coming from the saddle between Lille and Store Haugmelen is crossed, the trail then heads uphill with this creek on its left side. Store Haugmelen has two summit points, the higher being closer to Lille Haugmelen (to the left as viewed from below). The trail eventually climbs into the distinct saddle between these two summits, then heads for the highest point. This trail is nice and easy to follow all the way, marked with red dots mostly painted on rocks as well as smaller cairns here and there. The difficulty never exceeds (YDS) class 1. Comments: This is a nice and easy trail very suitable for a family hike. The view from the summit all around is fabulous. The fjord landscape is both gentle and dramatic. This hike is 15 km roundtrip with 800 meter of vertical gain. I started from the gate at 0850, reached the summit after 1.5 hours of pretty fast hiking, enjoyed the scenery and a chocolate bar for almost 20 minutes before returning to the car at 1150, 3 hours round trip is likely quicker than what this nice area deserves. Where is the mountain? This looks like Eastern Norway. Lille og Store Haugmelen, still some forest. The cairn on Store Haugmelen. 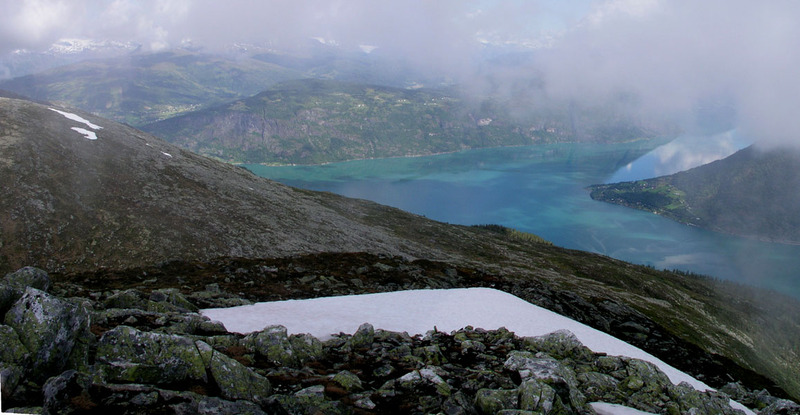 View from Store Haugmelen, Storehaugfjellet 1173m. Lustrafjorden as seen from Store Haugmelen. Roads in fjord country, a ferry may just bring you to a tunnel.